Professionals, Solutions, Programs & Resources for your School. What took root in an early initiative focused on school psychological intervention for underserved students has grown over four decades to meet the needs of the whole child in the context of today’s complex social and educational setting. Providing high-quality, innovative educational services in cost efficient models assists hundreds of thousands of children in improving their grades, attitudes, health and behavior. psi empowers each system’s educational professionals to achieve more, lead more effectively and offer every student a better opportunity to succeed in school and, ultimately, in life. Thank you for your interest in psi. We look forward to partnering with you and your school. psi is excited to announce yet another way we “Raise the Power of Education” for your schools, your students, and your school community! This commitment to serve the education community in Ohio and surrounding states is ever more evident through the new feature to psi's school health department. This addition enhances the exceptional psi health programs already in place. To find out more contact psi at 1-800.841.4774 or info@psi-solutions.org. Online therapy is now more prevalent than ever in education, as research shows online services can be just as effective and in-person direct services. The Virtualpsi platform is interactive, clear, precise and user-friendly. This value-added program can lead to greater reach to more students in a unique blended model (with in-person services) for therapy, school heath programs and instruction. psiCertify (a division of psi) trains school staff in critical areas requiring certification and specialized programming due to state mandates. A range of topics addressing many of today’s most timely student health issues is available. psiCertify training is primarily conducted face-to-face—we come to you! Some topics are available in webinar format as well. 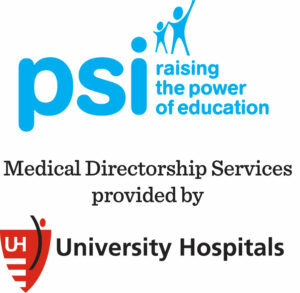 psi is focused 100% on providing educational and health services to schools, not only in terms of providing specific people and programs but also by offering school-wide and even system-wide perspectives. psi's School Improvement Team of Expert Partners designs and delivers professional development programs and interventions to improve academic and test score performance. Through the seven years we have used psi, they have consistently been available to meet with me to review concerns or to check in to make sure our programs are running smoothly. They have always provided quality support services to our staff and students, and the employees we have hired through psi truly care about our families and work diligently to improve student learning. We have used psi for nursing, intervention specialists, tutoring, psychologists and counselors. I have worked with psi for 11 years and will continue to do so because of their cost effectiveness, caliber of professional services, assistance with supervision and great sense of direction they provide. psi provides a wide variety of positions for our schools. In fact, we have probably used every type of staff available through them. While psi’s fees are not the lowest in the area, I recommend them because they do their best to provide quality personnel. They have always been understanding and professional in their encounters with our school administrators, and the financial assistance provided with the use of the Jon Peterson Scholarship is top notch.